In honor of the 50th Anniversary of Black Studies at Berkeley High School, YGB will join the year long celebration. 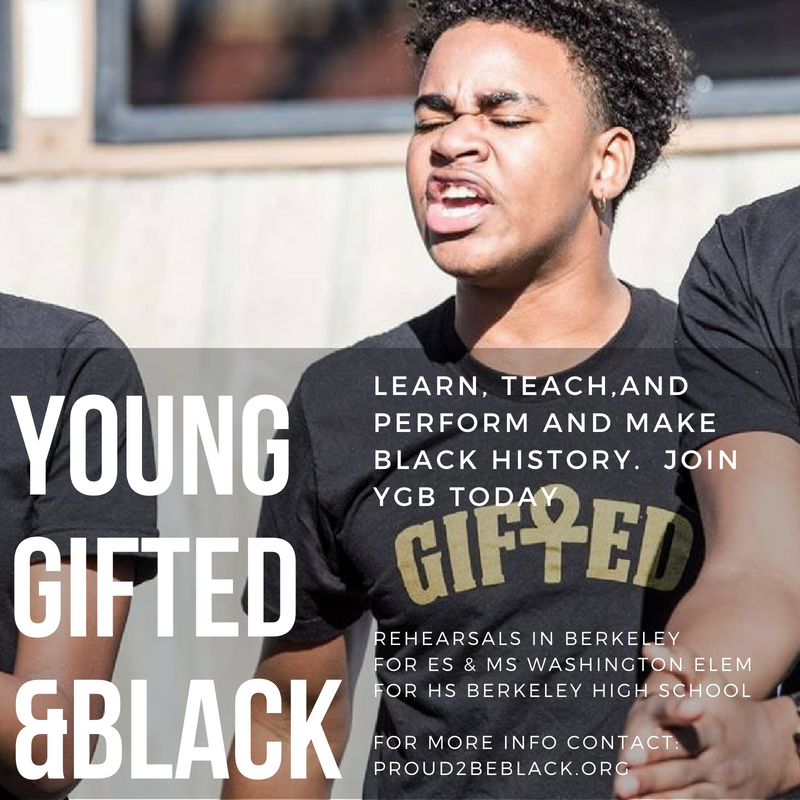 Young Gifted and Black of Oakland was formed in 2010, and featured 4 youth ensembles that perform and teach Black History. Their performances are usually somewhere between 7 - 18 Minutes and include poetic presentations usually without any musical accompaniment. Each performance includes choral poems, individual performances, raps, songs and chants designed to uplift African American people and to teach and learn Black history. The Youth of YGB attend over 30 different schools, and come together twice per week to rehearse material, study history and prepare for their presentations. Throughout the year YGB delivers over 50 performances in schools, museums, churches and theaters, at conferences, festivals, ceremonies and special events for audiences ranging in size from 25 to 2500. Many of these young people are seasoned performers and have been in YGB for multiple years. YGB is under the direction of accomplished and dynamic educators and artists with extensive experience in arts education, Black history and youth development. Young Gifted and Black of Oakland was formed around a group of elementary and middle school students in 2010. We currently have 15 members of "The Kids" spanning Berkeley, and Oakland, ages 7 - 14. These kids attend 10 different Bay Area schools, and rehearse weekly at Washington Elementary School in Berkeley. Over the past six years many of them have performed for thousands of people throughout the Bay Area. They continue to be an inspiration to people young and old. Joining YGB is a simple process that begins with contacting the organization and / or filling out the form, in the navigation bar above. YGB is currently accepting new members. The kids are currently get restarted for the upcoming year, and need time to develop their skills in rehearsal. They will be working diligently to be available for extensive booking during Black History Month. Until then, we are keeping them in the lab. The YGB Kids are currently available for booking. The Black Sheroes are the most seasoned of the YGB performance ensembles. They consist of young women ages 14 - 18 who attend different High Schools in the Bay Area. As a group they have performed for thousands of people, featuring at conferences, festivals, showcases, assemblies, protests, schools, rallies, and other community events. Their unique presentations feature songs, raps, poetry and compelling individual and choral performances. They are often booked at events celebrating the power and potential of women. Many of the members have performed with YGB for over 5 years, and carry the legacy of the organization with them. Several of them have traveled with YGB and their performance is a reflection fo their experience as participants. They have performed for Black Heroes and fellow Sheroes including Nikki Giovanni, Mama Charlotte O’neal, Alycia Garza, Melissa Harris Perry, and a host of others. They are currently the only YGB group available for booking. YGB Gold features many of the Black Sheroes and the boys who formerly constituted the Young Black Kings. This group remains anchored by members of the original Black Gold. Under the direction of founding member of YGB Oakland Alonzo Henderson, and founding member Ikera Davis, this group has performed for audiences throughout the Bay Area. Several of the members have traveled overseas representing YGB, and 10 recently returned from traveling this summer to Trinidad and Tobago where they performed at Emancipation Day Cascadoo Poetry Festivals. See YGB international page for details. Many of the members of this group have graduated from High School, and matriculated to Colleges around the country. This Crew is in a rebuilding stage and not currently available for booking.